The objective of Lift Off! is to be the first player to get their Aliens off the planet using resource cards, action cards‚ and phases of the moon to escape. If the planet explodes before everyone escapes‚ the player with the most saved Aliens wins. What’s special about Lift Off! 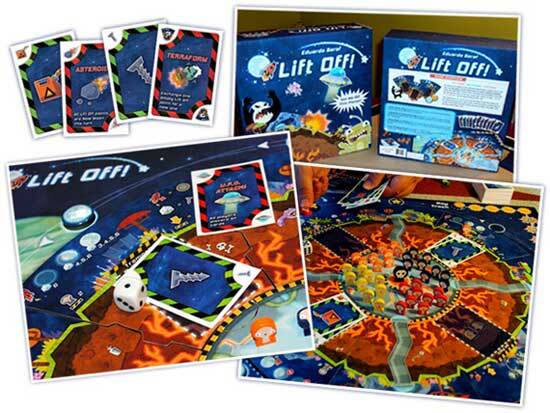 is that Lift Off Point board pieces (such as the Rocket Ship, Satellite, U.F.O etc) are all different and often require multiple players to work together to take off. For example, the Rocket Ship takes a lot of resources (6 Fuel and 6 Screws) and can carry 6 aliens from various players. This creates a great dynamic of semi-co-operative play that can turn real competitive, real fast; initially all players work together to get the first half of their aliens off the planet. Once the population starts thinning, people become more competitive and tricky, using action cards to manipulate the moon, terraform the board, create tornadoes, and more. Family Friendly! - There is also a family friendly rule variant with less "take that" included. Lift Off! 's game designer shows you the components and how to play. 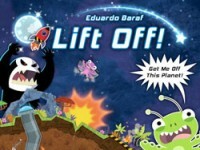 Add a Review for "Lift Off! Get me off this Planet"